The organization Women for Women International (WfWI) mobilizes women who suffer from war and postwar trauma, namely by helping them develop job skills. 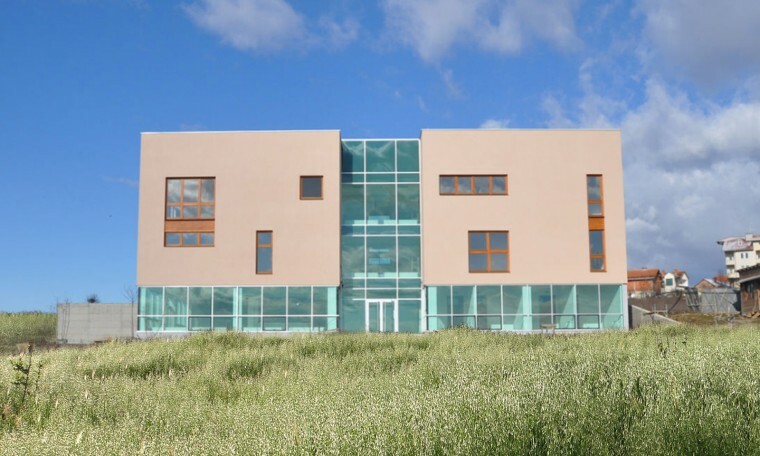 In Kosovo, the nonprofit is realizing its mission in a new three-story Opportunity Center that comprises educational, training, administrative and assembly spaces. Sharon Davis Design received the commission for this facility when foundation digging had already been completed; the project team completed its new design for the 11,750-square-foot building atop that existing footprint in 2009. The result maximizes flexibility for different programs, as well as long-term evolution of job-training pedagogy. The open-plan ground floor accommodates WfWI’s various commercial and community activities, for example, while second-floor classrooms are enclosed by demountable partitions for easy resizing or reconfiguration. The uppermost interior, which houses administrative staff, also features an open plan. Glazing artfully wraps around the building base and rises through its center to celebrate WfWI’s full mission and welcome newcomers. Additional fenestration adds syncopated visual rhythm to the highly insulated building, in a manner that is sensitive to the regional climate.